Stump and root removal jobs can present their own unique challenges and dangers. For this reason, you should always consult a professional stump removal company, and there are several critical things to consider before you allow any company to begin such a project. Once the above criteria has been satisfied, when the job commenses, you will want to make sure that all personal property, such as automobiles are a safe distance from the work zone. 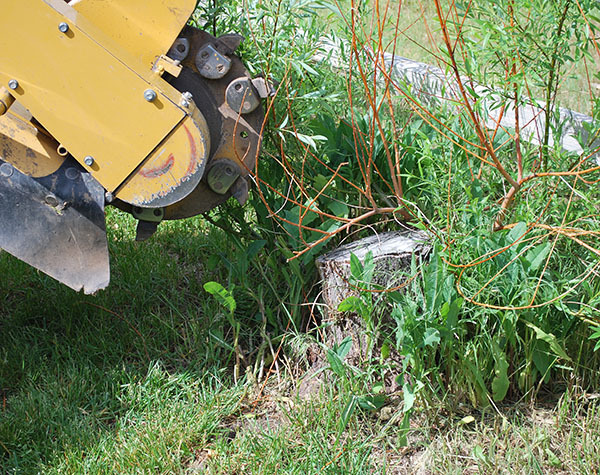 Be sure and let your neighbors know you are having stumps removed, so they can protect their property and loved ones. Make sure there are no children playing nearby, or pets roaming about that could be hit with flying objects. Remember, saftey is paramount! Our technicians are not only experienced in identifying and dealing with all of the above mentioned situations, but also have the skill and expertise to safely work around and near gas lines, sewer lines, water lines, electrical lines, and in close proximity to dwellings and other objects without causing any damage. We offer stump removal services for a variety of situations. Whether you have hard to get to stumps, with little or no access, or if your stump is extremely large or hardened over time. We have the resources to get the job done, Everytime.